1930, London. The journalist, Jacob Flint, currently in charge of the crime desk at The Clarion, is on the trail of the story that will make his career – an interview with Rachel Savernake. Rachel Savernake, daughter of Judge Savernake, a man with a ruthless reputation, has been putting Scotland Yard to shame. Rachel solved the Chorus Girl Murder and now is in the process of tracking down a second savage killer. Or is she? When Flint’s colleague is attacked and dies after starting to investigate Rachel, he starts to question whether her agenda is really just that of the amateur sleuth, or whether something much more complex – and much more dangerous – is going on. Anyone who knows much about classic crime fiction knows about Martin Edwards. The writer of the essential The Golden Age Of Murder (no, still haven’t read that one yet) and The Story Of Classic Crime In 100(ish) Books and one of the forces behind the hugely successful British Library Crime Classics range, in particular compiling the many short story collections. But it’s just about possible that some readers will not be aware of Martin’s own crime writing. He’s the author of two particular series, the first featuring Liverpudlian lawyer Harry Devlin and the second featuring cold cases in the Lake District, and also some standalone novels, in particular the excellent Dancing For The Hangman, concerning the life and fate of Dr Crippen. His most recent title was The Dungeon House, released three years ago – and I’ve just realised that I’ve not read it! Whoops. 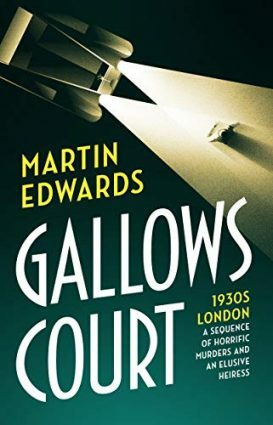 Anyway, Martin is back writing his own novels again with the soon-to-be-released Gallows Court. So what sort of book is it? It’s hard to describe in traditional terms, as it doesn’t fit easily into a genre. Imagine a modern thriller – of the Deaver genre, rather than the unreliable-narrator-which-man-in-my-life-is-trying-to-kill-me genre – wrapped up in a Golden Age detective novel. That would give you the most basic idea of the shape of the book. What it adds to both aspects of that genre is some very strong atmosphere and character work. The majority of the tale is from the point of view of Flint, an interesting lead as while I wouldn’t describe him as flawed, he is certainly not the sort of hero who is capable of dealing with everything that the book throws at him. We get more a picture of what Rachel Savernake is up to with some sections focussing on her and while she is presented as more of an enigma, she is a fascinating character – you can see why Flint becomes more and more fascinated with her. Generally speaking, the less said about the plot the better. There are several cracking twists – I think seasoned readers will guess one of them, which is probably why Martin chooses to reveal that hand earlier than you might expect – and the overall book is one of the most satisfying reads I’ve experienced for a long time. As you may be able to tell, Gallows Court comes with my Highest Recommendation. Gallows Court is released on Thursday 6th September from Head Of Zeus. Many thanks to Martin for the review copy. Happy to read that this was a hit. I will look forward to getting hold of a copy for myself. That aside I’ve just got my copy of Gallows Court, so you’ve certainly whetted my appetite for it. Hoping to bump it up the TBR pile queue, but want to make sure I start it when I have time to read over a few hours, as I feel like I’m not going to want to put it down! He channels his inner Edgar Wallace, it’s closer to Fantomâs than to Agatha Christie. A fun read.